Museum of Life and Science, Durham, North Carolina, U.S.A.
Target 4.4: By 2030, substantially increase the number of youth and adults who have relevant skills, including technical and vocational skills, for employment, decent jobs, and entrepreneurship. Our region—the Triangle area of North Carolina—has seen tremendous change since the Museum was founded in 1946. Durham has transformed from a rural community, where the major industry was tobacco, to a hub of research and innovation. Durham is now in the heart of the Research Triangle Park, home to high tech industry and leading universities. However, this transformation from rural to knowledge center has not included everyone. Our region is home to innovative growth as well as stubborn poverty and social issues, integrating a growing number of Spanish-speaking residents and other challenges. Approximately 22% of Durham County’s children live in poverty. In a world where science and technology surround us all and affect every aspect of our lives, the Museum recognizes that it must be a leading provider of science, technology, engineering, and math (STEM) education and the trusted source of science activities for all families. To do this, we listened to parents, teachers, community leaders, and policy makers to form an outreach program that encompasses low-income neighborhoods and schools, under-served communities, and the differently-abled. As an outcome of engaging in these experiences, we expect that children and adults will grow in their interest and understanding of science—and more broadly, to all STEM disciplines. We believe that more learning happens through membership and repeat visitation. For families who cannot afford the Museum, we created a $5 Ignite Learning membership to serve multi-generational and extended families. The program reduces economic barriers to science learning and provides a safe and engaging environment for families to discover and play together. We partner with local social work agencies to identify families living in poverty that would most benefit from a membership. The $5 investment establishes a family’s “buy-in” to the program. Families then receive two membership cards, which provide annual admission for up to six people, who may or may not be in their household, every time they visit the Museum. This enables families to have flexibility, acknowledging that the nuclear family is not a reality for most people, and encourages Ignite Learning members to bring other family, friends, or neighbors with them—increasing the overall reach of the program. This program served 6,000 visitors last year alone. In addition, we give 24 annual scholarships for our weeklong Summer Camps for children recommended by our partner agencies. We have witnessed tremendous outcomes from these hands-on science camps. Two siblings with developmental delays, who also lacked the opportunity to play with other children outside the home, made significant progress with language, cognitive, and gross motor development through their participation in summer camp along with visits to the Museum. Museum participation, along with other supports, ensured these children achieved age-appropriate development goals and school readiness. This year, we also held five free technology workshops tailored to our Ignite Learning families. 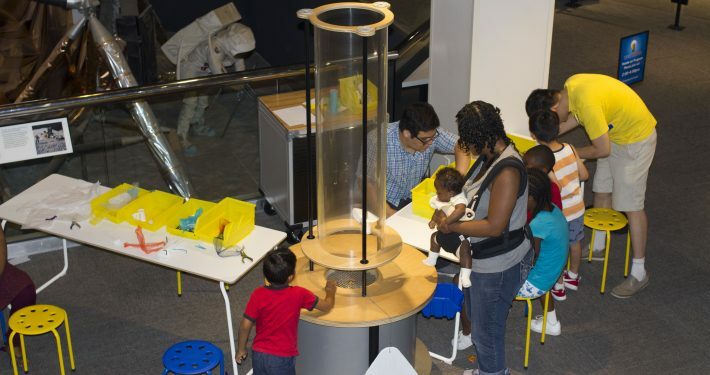 In general, the Museum’s tinkering and technology programs create a safe space for innovation and failure, where anyone can feel empowered to explore and experiment with different tools and technology, equipping participants with relevant skills to help them be successful in future STEM disciplines. Specifically, these Tinker Tech Family Workshops foster mutual learning interactions between children, parents, and family members. Durham is a diverse, multicultural community surrounded by a rapidly expanding tech industry that seeks creative, adaptable thinkers as the next generation of employees. We’re helping to start that career pipeline by providing programs that develop 21st century skills. Participants are encouraged toward self-directed, open-ended exploration that allows them to adapt as they go, changing the direction of their learning experience as they discover new things. The Museum has had a huge impact on Ignite members in many additional ways, from enabling families to spend quality time together to fostering relationships between families who have a passion for science and even helping a mother overcome social isolation. One refugee grandmother had her first ever encounter with dinosaurs on our Dinosaur Trail. Another mother overcame her apprehension for technology in our Tinker Tech workshops by building and programming her own robot. Our close relationship with the Ignite partners has enabled us to keep a pulse on the needs of the community and make the Museum welcoming to all. We continuously strive to deepen the connection with our Ignite families and are constantly adapting the program as needs arise. We are excited to observe the long-term effects the program will have on our explorers, of all ages. We look forward to witnessing their many accomplishments and supporting them as they engage with STEM, preparing them to be full participants in their communities and in our global society.